Boil the barley in salted water for 20 minutes, strain it, rinse it under cold water and drain well. Cut the courgettes and aubergine into thick slices and the pepper into strips, then cook all the vegetables on a hot griddle. Chop the rosemary, dice the grilled vegetables and mix everything together. Season with salt and pepper and a good splash of oil and add the barley. Drain the tuna, cut it into chunks and add to the mix. You can add even more twist to this recipe by adding some fresh mint leaves, finely shredded, and the juice of half a lemon. This is an all-in-one dish, meaning that theoretically you really don't need to have anything else with it. But in case you're still hungry, a green leafy salad with a nicely diced tomato could be a good choice! Vernaccia di San Gimignano La Gentilesca DOCG among the red wines. Franciacorta or prosecco if you like it sparkling, otherwise Insolia Chardonnay Terre Siciliane IGT, Sauvignon blanc or Pinot gris. In case you like it better, you can use tuna in olive oil! 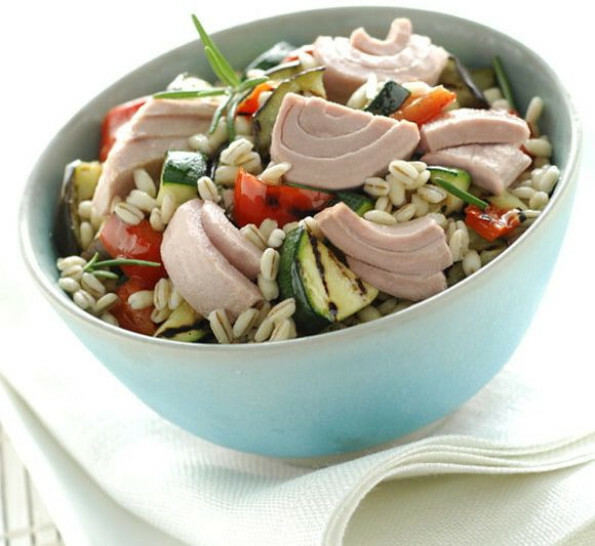 Barley is a wonderfully versatile cereal grain with a rich nutty flavour and an appealing chewy, pasta-like consistency. It originated in Ethiopia and Southeast Asia, where it has been cultivated for more than 10,000 years. In addition to its robust flavor, barley's claim to nutritional fame is based on it being a very good source of molybdenum, manganese, dietary fibre (roughage), and selenium, as well as of copper, vitamin B1, chromium, phosphorus, magnesium, and niacin. In this recipe, garden meets sea in a wonderful salad combining grains, fish and vegetables, an ideal summer dish for any occasion. Delicious eaten cold, you can serve it in a buffet if you are throwing a party, or prepare it for your friends. Or even take it with you to work, or as a picnic, by putting it in a Tupperware container!